Here you will find all the information, tricks, know-how, and advice to help you print your 3D model in our Binder Jetting Stainless Steel 316 material. Our Binder Jetting Stainless Steel 316 is a great metal to 3D print your small-size parts. This material is composed of a Stainless Steel 316 alloy and has relatively good mechanical properties. Stainless Steel 316 has a strong resistance against corrosion and a high-temperature resistance. These features make it a great material for tooling, molds and injection molding or to create parts to be used for the consumer goods sector. Unpolished, the material has a silver color and a granular surface. Thanks to finishing, you can obtain a smooth and shiny surface. To learn more, refer to our paragraph about finishes and colors . The approximate shipping time for Binder Jetting Stainless Steel 316 is 16 days. The estimated shipping time is also calculated automatically as the object is uploaded. Once you upload your 3D model to our website, it is received by a Sculpteo team member, who expertly places the model into the next available batch. The printer we use for 3D printing binder jetting stainless steel is an Exone M-Flex. 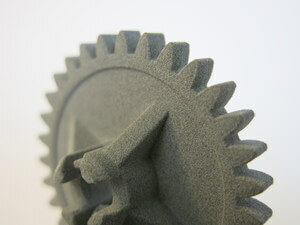 Binder Jetting is a 3D printing technique that uses a binding agent deposited selectively on a powder to join the material particules. Layers of material are then bonded, t he job box lowers and another layer of powder is then spread and binding agent is added. Over time, the part develops through the layering of powder and binder. The build box is placed in an oven and cured to be solidified. The object is brushed and cleaned to remove the powder. 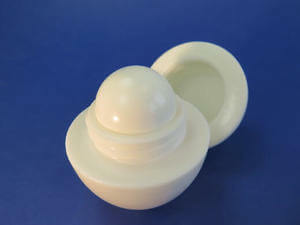 The object is brushed again, which removes a large portion of the powder, and beadblasted, which removes the fine powder that the brush may have missed. From there the object can be polished depending on the finishing you chose. Our polishing technique involves small stones in a rotating/vibrating cauldron - as the stones brush up against the object, small imperfections in the surface are smoothed. To learn more, refer to the paragraph on finishes for Binder Jetting Stainless Steel 316 models. Binder Jetting Stainless Steel 316 offers high temperature resistance and can handle complex shapes. This 3D printing metal has a wide range of uses from mechanical applications, tooling, mold creation and injection molding. The surface of the raw stainless steel is granular and slightly porous. The polished version is smoother but the layers can still be visible on rounded surface. The Binder Jetting Stainless Steel 316 can be painted, welded, powder coated, drilled, tapped, machined. 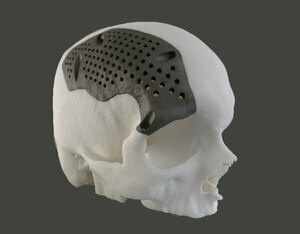 There are multiple finishing options available at Sculpteo. The polishing introduces a size restriction on your object. To learn more please check out size restrictions. Moreover, not all designs can be polished, and in some cases you will be informed that the finishing you asked for is not available. In particular: wire-framed parts, fragile parts, thin-walled parts, and large flat parts cannot be polished; and part containing fluid-holding type cavities cannot be polished. The layer thickness for our binder jetting stainless steel is 100 µm. Shrinkage may occur during the ExOne process as well as some deformation due to the post-printing process. The maximum size of your models are limited by the physical size of our 3D printers - nothing can be printed larger than the printer bed. The same goes for our polishing - if it doesn’t fit, it can’t be used. Moreover, please note that parts will require 18 - 20% scale up due to shrinkage in the furnace cycle. The walls of your design must adhere to a minimum thickness in order to guarantee the structure will not break. We recommend that you design your model by respecting the minimum thickness that is specific to Binder Jetting Stainless Steel 316 and which is variable depending on the size of your part. If the walls of your model are less than 1.1 mm, you can add a support structure to maintain stability. Thin walls supporting large, heavy stainless steel models can warp under the weight of itself. Sculpteo offers an online solidity check tool which highlights parts of the print that may be too thin for a print. From there you are able to tweak your design in order to create an object that is an appropriate thickness. To use it, you just need to upload your 3D file , select your material and click on the “Verification” tab. It is also important to keep in mind that the object is meant to be printed in real life. Thus if a thin aspect is supporting something that is too heavy for it, it may break - even though it is possible within the physics provided by your 3D modeling software. We recommend adding a bit of thickness to the places that will get a lot of handling, or that support the most weight. Overhangs must be designed to support their own weight. Unsupported features over 25.40 mm. (1.00 in.) will not be accepted. Fillets help support overhang structures during furnace processing. Inside edges and sharp intersections need to have a filleted edge that meets the required wall thickness minimum. Filleted edges help ensure successful part tolerances. Knife edges/pointed edges will fail during the depowdering process. Fillet all knife edges with a 1.00 mm (0.03 in.) radius to avoid breakage during depowdering. Edges that come to a point lower than the recommended tolerance are subject to rejection. Parts will be rounded in polishing. Sculpteo will typically add a stilt to your part. Stilts are necessary to allow bronze to infiltrate the part in post-processing. Stilt placement can be difficult because of part design. Texture and surface areas should be considered in designs. Part will have slight blemish from stilt removal. We will attempt to keep the blemish miminal. Stilt will appear more prominent depending on the selected finish. It’s possible that particularly fine embossings and engravings will not be visible, as the carving could get filled with excess of powder that is later unable to be cleaned out. If an embossing or engraving is an essential part of your design we recommend making them as deep as possible. To ensure a better powder removal (thus a better detail visibility), the width of your details must be at least as big as depth. Our Binder Jetting Stainless Steel 316 material is not well suited for enclosed volumes and interlocking parts. Objects printed in Stainless Steel can be printed to be assembled. As long as a width of at least 0.5 mm is left between the different parts of the object. Hollowing your stainless steel parts allows you to make them lighter, and reduce the price of printing but it is necessary to respect a minimum diameter. Otherwise we will not be able to remove the powder completely from the inside cavity. Our online hollowing optimization tool has the ability to calculate this automatically. It is not possible to 3D print a 3D file containing several objects with our 3D Binder Jetting Stainless Steel printers. It is not possible to print a 3D file containing several objects, that's why we cannot accept files that contain clusters of multiple objects. Though, if you wish to purchase more than one identical parts, you can select the number of parts you want to order during the checkout. The more parts you order, the lower your price per part gets. To get more information on your metal additive manufacturing service, you can contact our qualified sales team.